See the little man crawling up the side of the box in this recent painting Scott did? This art completed on January 10th foreshadowed Scott’s own epic journey on January 12th. He insisted we have our special love-in within the loveliest room of the hotel– the penthouse suite on the third floor. Our friend Joel was staying there but graciously agreed to let us have the ceremony there, and, later he traded rooms with us for the night. The penthouse has magnificent views to the ocean. It’s furnished with Indian antiques (the most impressive Rajhastani four poster bed we’ve ever seen) and has an open air bathroom. The room is completely enclosed by sliding glass doors that open out to the verandah overlooking the rest of Sur La Mer. Scott had been instructed by Dr. George to get a minimum of 24 hours complete bedrest after the asites drainage. Scott had his own ideas. A mere twenty hours later he rose out of bed with renewed vigor having removed 22lbs of fluid and also reduced the edema swelling in his feet and ankles. We doublechecked the bandages covering his incision before he donned the new ikat striped kurta I had bought him at Fabindia, and with his Uncle Bob’s bear-headed walking stick in hand headed towards the stairwell to the penthouse where I was waiting for him and our guests to arrive. I sat around upstairs at least half an hour before Scott’s pal JB found me in the penthouse. One look at JB’s disapproving countenance told me all I needed to know: Scott was having serious trouble managing the stairs but was stubbornly refusing to give up. As if I would be able to stop Scott Morgan when he has his heart set on something. Anyone who knows Scott well knows that! The penthouse is only three stories up but the floors are double height so there are six flights with landings. I caught up with Scott on the first landing, his new garb drenched in sweat, surrounded by Joel and Aneel and Arjun and Sanjiv. Scott was sitting on a pillow in a chair. JB rejoined the group, too. No talk of aborting this mission was tolerated. All we could do was bring him water, get him out of the clothing and into his yukata robe, fan him and encourage him to continue. Carrying him in a chair was suggested but our stairmaster dismissed the idea –and the Sherpas standing by– immediately. proceed with the ceremony. Shortly after we watched a spectacular Goan sunset, Scott signaled his readiness to begin. I climbed into the bed next to my love as Joel began reading from our magnificent ceremony script written by Uncle Bob’s daughter Jill Satin. 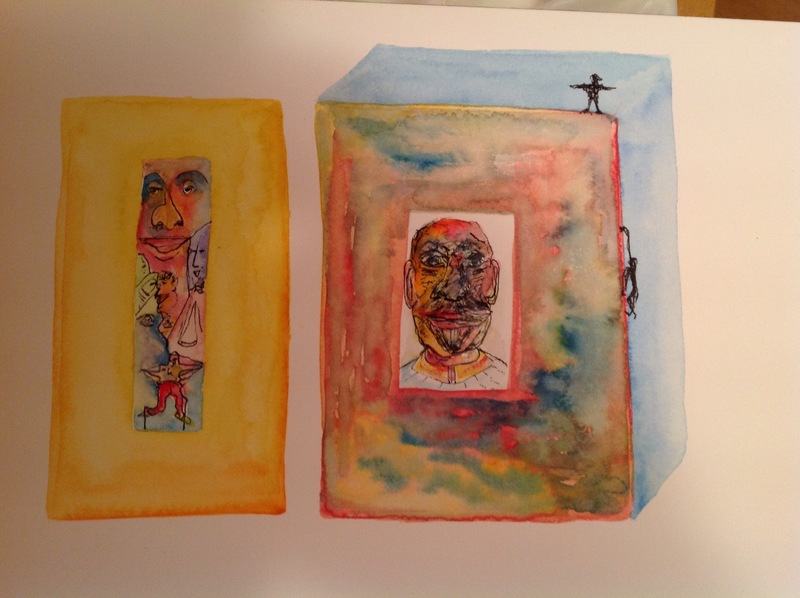 This entry was posted in Uncategorized and tagged art, courage, Going to Goa Blog, heroic efforts, love, relationship, Scott Morgan, traveling with cancer, Watercolor painting. Bookmark the permalink.